Where can I check my received payments in the new Back Office? The balance section displays all the operations that was made on your DaCast account during the on-going year. 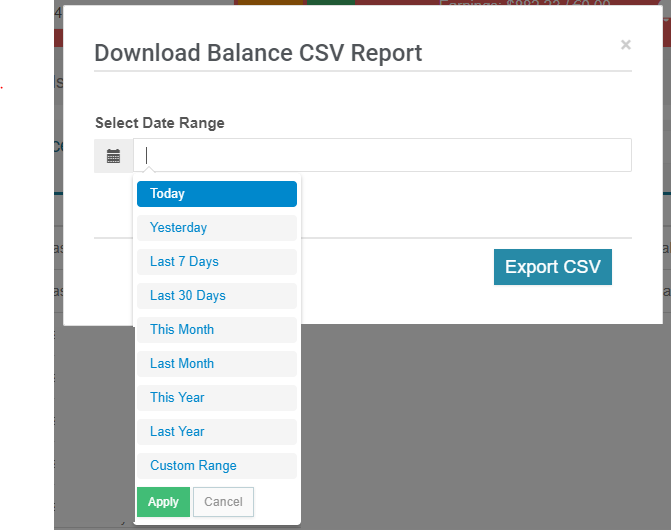 If you want to access more operations, we invite you to download your CSV after choosing the time period you want (see section C for more details on the CSV). Column 6: the exact amount that got credited on your account. Please note that on the price you set up for your viewers, DaCast takes a small commission: 9.9% plus $0.40 on each viewer purchase. You can access the price and the amount of fees for each viewer purchase in your CSV report. Column 7: the exact amount that got debited from your account (in case of a payment or a refund). You have the ability to filter your operations by keyword. 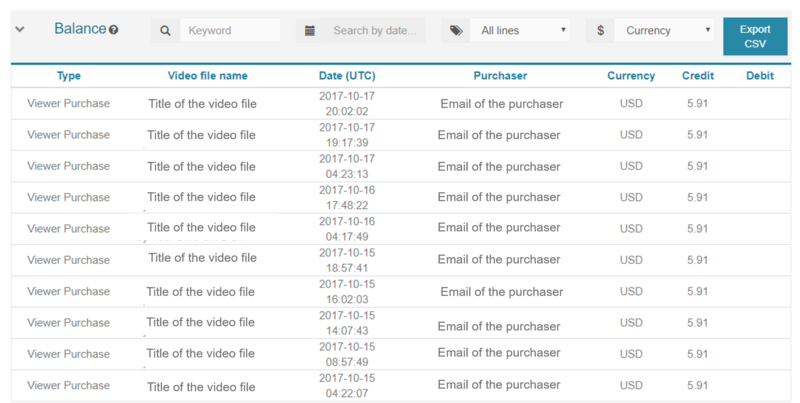 This is particulary useful when you are looking for all the operations related to a specific video file or when you are looking for the purchase of one specific viewer. In that case you can type a part of the title of the video file or enter the email of the viewer and you should get what you are looking for. This filter allows you to display only your viewer purchases or only your payments for instance. In case you have operations using both currencies, USD and EUR, you have the ability to display only your USD operations or your EUR operations. You will just have to select the time range you need. The last option gives you the ability to choose a custom time period. Once you have selected the time range, please click on “EXPORT CSV”. Our system will generate the report and the downloading of the CSV report will automatically start. Please note that if you have many operations and you select a large time period, your report might take few minutes to start downloading. The balance on your account (the amount next to “Earnings” that you see in the top bar of your DaCast account) is the net balance on your account since the beginning of your activity with DaCast. Please note that payment might be declined if we receive refund requests from your viewers. We will work to negotiate this issue first, or have you agree to pay the viewer(s) from your payout if preferred.